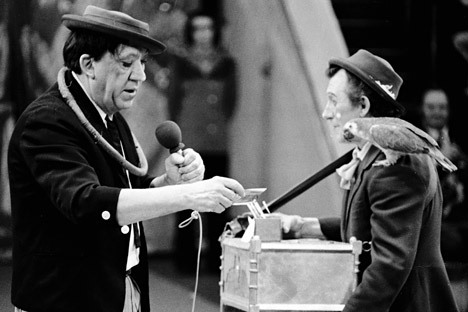 What would the legendary Soviet comedian have to say about the way things are turning out between Russia and Ukraine? I miss Yury Nikulin. I’m not sure what – if anything – he would say or do, but having a national clown weigh in on situations is not a bad idea. He was famous for his jokes back in the Soviet days, sometimes when there wasn’t anything to laugh about. But laugh he did, his humor bringing circus audiences to cry out with laughter as well. I saw Nikulin once, in his office, in the Nikulin Circus on Tsvetnoi Boulevard. He was a large man, with his telltale wrinkles. There were lots of people in this office who knew him and conversed fluidly. I just stood there, in awe of this movie star and circus great who commanded so much national attention with his jokes and humor, and political clout. As the Russians know, Nikulin was more than just a circus clown, a comic actor, and the director of Russia’s second oldest circus. He was revered in the government as well, and always seemed to have his say, or at least express his opinion about national affairs, and his opinion was listened to. I don’t know what he’d have to say about the current political situation between the Ukraine and Russia, but I have a sense that it’d be something soothing, something that brought the conflicting nations together, perhaps even in a funny kind of way. One thing I noticed in the ten years that I lived in Moscow was that humor is a big part of the Russian culture, especially during times that were difficult and on the dark side. Perhaps he would remind the public that circus life is made up of performers from all of the former Soviet Union, and they have been for decades. It’s been said that the circus is the one place the mixture of ethnic groups got along, from acts featuring the Ukrainian acrobats to the horse acts known for their Central Asia masters. I’m not the only one who misses Nikulin. The day after he died, thousands of Muskovites lined up with odd numbers of red carnations, waiting their turn to enter the circus and pay their last respects to someone irreplaceable. I have Nikulin’s portrait hanging in my living room to remind me to laugh at life and to find humor in my daily life. It’s not always possible, just as politics are not always pretty, but still, it’s soothing to have an honest to God clown looking over us all with a smile and his favorite parrot. People like him give us hope.